Vanadium pentoxide is one of the most widely investigated multifunctional materials for electro-chromic and electro-chemical device applications. Its layered and open structure makes this material in thin film form well suited for electro-chemical insertion reactions with the Li ions. In the present investigation, V2O5 thin films have been prepared by electron beam evaporation technique at a substrate temperature of 523 K in an oxygen partial pressure of 2 × 10−4 mbar. The XRD patterns exhibited predominant (001) diffraction orientation along with (200) and (400) characteristic peaks corresponding to orthorhombic phase of V2O5 with Pmnm space group. The estimated average grain size is about 90 nm. The optical absorption coefficient ‘α’ determined from the experimentally measured transmittance and reflectance data for V2O5 films was fund to give a better fit for the exponent n = 3/2 suggesting the direct forbidden transitions with an estimated optical band gap of 2.36 eV. 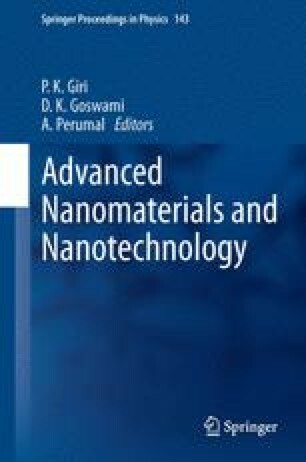 Two sets of films were prepared with thickness of 300 nm on ITO coated glass for electrochromic analysis and 600 nm on metalized silicon for electrochemical insertion studies. The electron beam evaporated V2O5 thin films with thickness 300 nm showed a good reversible cyclic voltammogram on sweeping the potential downward and upward. A two step electrochromism i.e. yellow to green and green to deep blue was observed from reversible current—voltage curves. The electrochemical characteristics of V2O5 thin films with thickness 600 nm were examined in non-aqueous region. The film exhibited a discharge capacity of 70 μAh/(cm2–μm) at a current density of 10 μA/cm2. Annealing of these films at 673 K exhibited a better discharge capacity of 90 μAh/(cm2–μm). The authors would like to thank the University Grants Commision, New Delhi for providing the financial support.